While the Fantastic Four visit State U, Reed and Ben’s old alma mater, they are again menaced by the evil alchemist Diablo who brings to life the fire-breathing android Dragon Man. Afterwards, Reed finally proposes to Sue and they set a wedding date. The Wizard recruits a mysterious woman with living prehensile hair, Madame Medusa, to join the "Frightful Four" (The Wizard, the Sandman, and Paste-Pot Pete). The Inhuman Medusa was actually an exile from the hidden Great Refuge but lost her memory in a plane crash. When the Frightful Four attack, the FF only barely escape defeat. The Frightful Four attack the FF again and draw them to an island in the Pacific. The Wizard detonates a Q-bomb, but Sue's force-field saves them. However they lose their powers due to the radiation. Dr. Doom retrieves the memory of his defeat by Reed the previous year and invades the FF's Baxter Building HQ. The blind superhero, Daredevil, aids the powerless FF until Reed restores their superpowers with his stimulator gun invention. 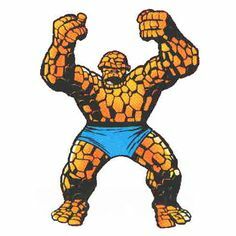 During the "Battle of the Baxter Building", Ben single-handedly defeats Doom, but is so angered at having to become the Thing again he quits the FF. The Hulk battles artificial "sponge" humanoids created by the Leader, a gamma-radiation enhanced evil genius. Later, the Hulk is shot while changing into Banner. To save his life Rick Jones changes him back to the Hulk, but with Banner's mind. General Ross corners the Hulk in his secret cave base and plans to drop an atomic bomb on him. He is saved when the Leader teleports him to the Leader's base in Italy. In return, the Hulk is forced to steal a device from my (the Watcher) home on the Moon which can transfer all knowledge of the universe to its wielder. The power of the device is too great and puts the Leader into a deathlike coma. Xavier calls the X-Men to help him defeat the alien Lucifer in the Balkans, but they end up battling the Avengers who are also investigating. Iron Man faces the Mandarin again when a death ray destroys Tony Stark's home. Iron Man is bested by the Mandarin in single combat but is able to escape when the Communist Chinese attack the Mandarin. Later, Iron Man is challenged to a public battle by the Soviet Titanium Man. In Antarctica the X-Men discover the "wild-man" Ka-Zar and his home the Savage Land. Together they battle the Swamp Men. Ka-Zar tells them never to return. Magneto & his Brotherhood of Evil Mutants encounter the mysterious "Stranger" and attempt to recruit him as a mutant. The Stranger reveals that he is actually an alien and leaves Earth, taking Magneto and Toad with him, but not before turning Mastermind to stone. Quicksilver and Wanda, tired of conflict, return home to Central Europe.The threat of the (1st) Brotherhood of Evil Mutants is ended. The Avengers battle Count Nefaria of the organized crime group, the Maggia. Cap travels to South America again to rescue Rick Jones who has been kidnapped by Zemo. In this final battle Baron Zemo is killed, and Bucky’s death is avenged. Loki creates the Absorbing Man from prison inmate Crusher Creel. During Creel's attack on Thor, Loki kidnaps Jane Foster and takes her to Asgard. Odin is angered and orders the Trial of the Gods. Thor returns to Earth and defeats the Absorbing Man by transmuting him into helium gas. In Asgard, he faces Loki in the Trial of the Gods. The Avengers changes most of its standing membership and becomes Captain America, Hawkeye, the Scarlet Witch and Quicksilver (Thor is still in Asgard and so is not present). The new Avengers clash with Hawkeye’s old mentor, the Swordsman. The Enchantress makes Erik Josten into Power-Man (Atlas) and sets him after the Avengers. The Avengers battle Kang in his own time. Kang's true love, Princess Ravonna is shot by his own lieutenant. Thor returns to Earth but Loki sets the Destroyer against him (the Destroyer was originally created by Odin to fight against the god-like alien Celestials). Thor prevails but not before the Destroyer has split Thor's hammer, Mjolnir. He repairs Mjolnir and learns of the new Avengers line-up. In NY, Thor is attacked by the returned Absorbing Man, who is almost defeated, but Loki spirits him to Asgard and he attacks Odin. Odin banishes Loki and Creel to outer space for their brash behavior. The magically-enhanced, unstoppable Juggernaut digs himself out from under a mountain in Korea and attacks his stepbrother Xavier and the X-Men, but with the help of the FF's Human Torch, is defeated. Anthropologist Bolivar Trask begins campaigning against mutant-kind. The X-Men first face his mutant-hunting robots, the Sentinels. J. Jonah Jameson hires Prof. Stillwell to make thug Mac Gargan into the Scorpion. Spidey defeats him but Jameson fears that someone will find out his role in creating a supervillain. Jameson becomes so obsessed with defeating Spider-Man that he has Spencer Smythe create the Spider-Slayer, a robot which actually shows Jameson's face on a screen while it attacks Spider-Man. Spider-Man is menaced by the Molten Man. He also graduates High School. In college at State U., Peter Parker meets Harry Osborn and future love interest Gwen Stacy. Daredevil fights the Sub-Mariner in one of his most over-matched yet valiant battles. 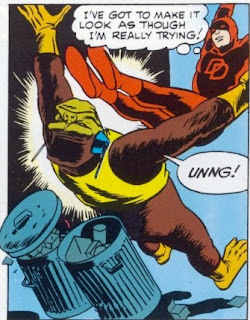 Daredevil first fights the mechanically-aided Stilt-Man. In the Himalayas, Baron Mordo, his power dramatically increased by the Dread Dormammu, attacks the Ancient One at his home. Dr. Strange escapes with the Ancient One and goes into hiding. Dormammu imprisons Clea for helping Strange. Strange learns the secret of "Eternity" from the subconscious mind of the Ancient One. Eternity however refuses to provide any kind of aid, and when Strange returns to Earth he faces the combined threat of Mordo and Dormammu. In the Dark Dimension in a battle using the Pincers of Power, Dormammu is defeated. He exiles Mordo for interfering in the battle and hurls Clea to an unknown dimension. Nick Fury joins the counter-terror agency SHIELD to battle the forces of the sinister organization, HYDRA. Eventually the HYDRA organization in America is shattered and the Imperial Hydra (Arnold Brown) is mistakenly killed by his own men. Warlord Krang usurps the throne of Atlantis. Namor goes on a quest for the trident of Neptune to prove that he is the rightful heir to the throne. Eventually Namor finds the trident of Neptune, defeats Krang and regains the throne of Atlantis. Dr. Doom uses the Emotion Charger to induce villains to attack the FF on Reed and Sue's wedding day. With the Watcher's help, Reed sends the villains away, and he and Sue get married. Every superhero in NY attends, including Nick Fury, Patsy Walker, and Marvel's Lee & Kirby (though they are actually turned away). The FF learn that Medusa is actually a member of the Inhumans, a race of genetically-engineered xenophobes. They pursue them to the Great Refuge, their hidden city. When the Inhumans' leader, Black Bolt, assumes his rightful place as king, his brother, the mad Maximus, fires an "Atmo-gun" intending to kill all non-Inhumans. It fails, but Maximus is still able to erect an unpenetrable barrier around the Great Refuge.